Adventure Of A Lifetime outside the normal esl language centers! Well what can we say? It looks like winter has finally arrived here at the ranch and it is truly spectacular! Why sit in a classroom surrounded by building and noise when you could be up here with us surrounded by nature and snow? How many esl language centers do you know with an environment like this? If you are looking for an adventure of a lifetime where you can live, work and learn in one of Canadians most beautiful landscape then our full English learning program is for you! At the ESL Wilderness Ranch,, our unique environment and location enables us to offer our students so much more than just English Lessons that you could find in standard esl language centers. 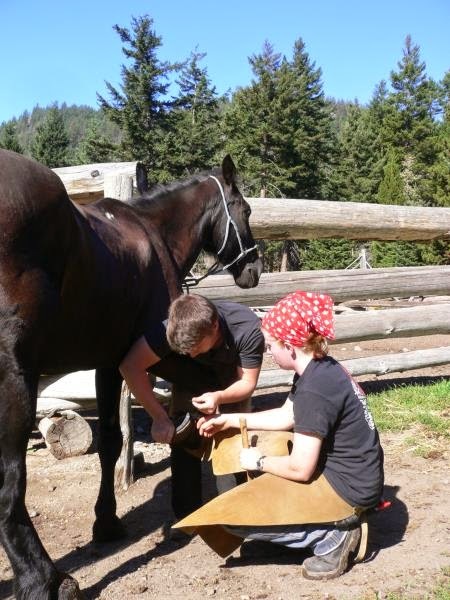 With over 40 horses an the ranch our students have the opportunity to ride, bike and hike our many trails and also take part in other horse and ranch activities such as learning how to shoe a horse, drive a tractor, and use a chainsaw. Whatever the season, you can enjoy an enriching Canadian experience in a historical rural wilderness setting, engage in a specialized activity with expert instruction – and learn English from uniquely qualified teachers. Contact us now to book your elite Winter experience full of learning, adventure and fun!